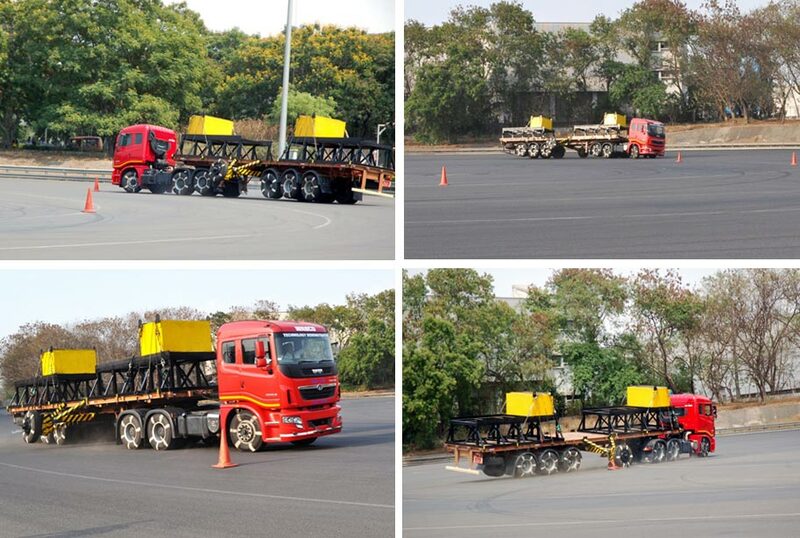 Tata Motors Limited, a leading Global Automobile Manufacturer showcased the new safety technology – Electronic Stability Control (ESCsmart™) for the range of PRIMA and SIGNA trucks at an event in Chennai today. In addition to this, it also offers Automatic Traction Control (ATC) and Hill Start Aid (HSA) safety technology for the range of trucks and buses which will go a long way in helping prevent truck and bus accidents by increasing vehicle stability and safety. Developed in partnership with WABCO INDIA, these technologies provide complete value to customers by providing vehicle stability, reducing accident risk, repair cost and improving vehicle uptime, thus enhancing road safety and efficiency of commercial vehicles. Electronic Stability Control (ESC) functionality is added on Anti-lock Braking System (ABS) which was introduced as a part of regulatory compliance as per CENTRAL MOTORS Vehicle Rules promulgated by Govt. of India for all vehicles more than 12 ton GVW. While ABS contributes significantly to the safety of vehicles under different road conditions, ESC takes the safety to the next level by providing safety under demanding conditions of various handling maneuvers, thereby preventing or minimizing the probability of accidents. This clearly demonstrates Tata Motors’ proactive approach of making available to the INDIAN Truck and Fleet Operators, class-leading technologies through intensive R&D and deep understanding of the operating conditions in India. Functionally ESC predicts forthcoming instability and automatically intervenes by applying brakes to avoid rollover, skidding and jack-knifing. It measures vehicle’s lateral acceleration, roll about its vertical axis through sensors, and applies brakes on selective wheels to control instability. Benefits to the customers shall be in terms of preventing jack-knifing in tractor-trailer, improve directional stability during dynamic maneuvers, prevent roll over during turning at high speed. ESC shall be available on Prima – Tractors 4025.S, 4925 and Trucks 2523T, 3123T and 3723T and Signa LPS 4018 and LPS 4923 as well as LPT platforms of 25T, 31T and 37T. Automatic Traction Control- Prevents wheel spin during acceleration under different surface conditions, especially slippery surface like mining, water and ice. Prevents loss of traction of one or more wheels. This further helps Increase tyre life by averting loss of traction of one or more wheels. Hill Start Aid- Prevents roll back of vehicle during “Stop & Go” situation on an uphill gradient and helps minimize clutch and brake liner wear.